Electro Suspension Magnet consisting of aluminum or copper wound coils immersed in a transformer oil (for prevention of overheating or shorting) or air-cooled for extreme or dusty environments.All electro suspension magnet comes along with control panel. Operating heights up to 150 mm to 450 mm are available. Manually cleaned magnets can be supplied with a stripper mechanism. No power consumption, virtually maintenance free. The ERBM Series magnet is a powerful oil-cooled electromagnetic plate magnet, suspended over the conveyed product stream. 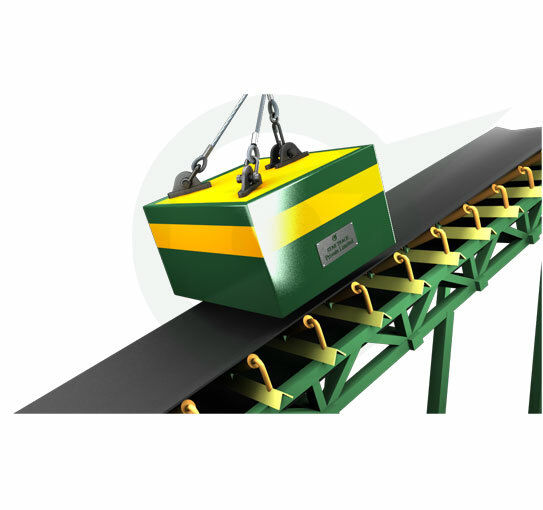 The magnet should be located in an area on the production line that allows easy access for proper maintenance of the magnet and it should be operated in an area where no intregal parts of the conveying system can become magnetized; such as idler rollers, pulleys or belt support plates. 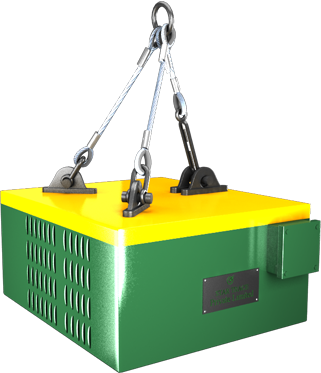 Self-Clean (SC) Suspended Electromagnets provide continuous, automatic removal of tramp iron and feature a heavy-duty belt, a channel frame for supporting the pulleys, adjustable belt take-up and drive. They are recommended where a large amount of tramp iron is expected or where there may be limited access to the magnet for cleaning purposes. 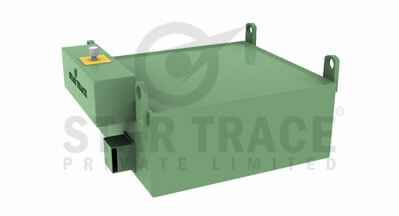 Star Trace Suspended Permanent Magnets are designed for high separation performance in over-the- belt conveyor applications. These heavy duty permanent magnets incorporation all welded construction are particularly effective in removing tramp metal in high volume applications. Produces strong magnetic field attraction. The separator body adopts rare earth permanent magnetic materials featuring high remanence, high coercivity and high magnetic energy as magnetic source. The magnetic property is persistent with high temperature stability. The magnetic steel is chosen from the national famous magnetic material enterprise (national inspection-exempted product) with high purity material and advanced manufacturing process to ensure the magnetic property will not affected by ambient temperature and mechanical vibration. The magnetic material is electroplated on the surface, and assembled with particular clamp by special man, to minimize the difference and make strict anticorrosion treatment. This series links up with transportation equipments such as all types of belt conveyers, vibration conveyers and charging pipelines to form a complete set to remove the iron magnetic materials under weight of 0.1~0.5kg mixed among the non-magnetic materials to ensure normal & safe operation of the next-step equipment (such as muller, crusher, etc.). This series of products are widely applied for cement industry, power industry, ore industry, ceramic industry, non-metallic ore industry, metal industry, chemical industry, glass industry, paper-making industry, building industry, sugar refining industry, pharmaceutics industry, food industry and so on. This product series can run under adverse environments without failure for a long time. Electro magnets are engineered for use in high volume and deep burden applications. Their primary advantages are their "deep reach" and the ability to be turned on and off.